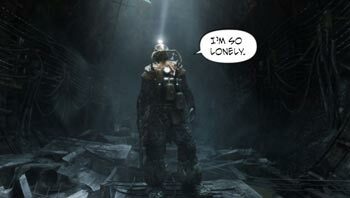 4A games may add multiplayer once Metro: Last Light ships but not before. It's an increasingly common story: Single player game is released to critical and commercial success, developers announce sequel, sequel contains tacked-on multiplayer mode no one cares about, developer laments wasted time and money. It seemed like Metro: Last Light was set to follow the same pattern, but instead 4A has opted to scrap the game's multiplayer mode, for now. "Right now we're 100% focused on the single player campaign and not thinking beyond that," revealed the studio. "We don't like throwing away work though, it's a project we could potentially return to after Metro: Last Light ships." "We are gamers at the studio and really wanted to bring the world of Metro to life in a multiplayer environment. It was a decision made by us at 4A from the outset and THQ have since been supportive every step of the way, including our decision to put multiplayer on hold. In hindsight, it was probably a mistake to announce it when we did, but we're an enthusiastic team and wanted to be open about what we were making!" At this point in the game's development it seems unlikely 4A will use their freed-up resources to add any extra content to the single player campaign - particularly since the 2013 release date hasn't changed - but it does mean the team can focus its efforts on fixing SP bugs. The MP component never really went beyond the prototype stage, meaning little time or effort was wasted. Like those in BioShock 2 and Dead Space 2, I don't think Metro's shot at a multipayer mode would have been bad, it just doesn't seem like an addition that plays to the franchise's strengths. Then again, I remember looking at the previews for Splinter Cell: Pandora Tomorrow and saying "what? Multiplayer? In a stealth game? That'll never work."